The Washington Lady Blue Lions celebrate breaking a long losing streak with a 6-5 win over the McClain Lady Tigers Thursday, Sept. 13, 2018 at Washington High School. 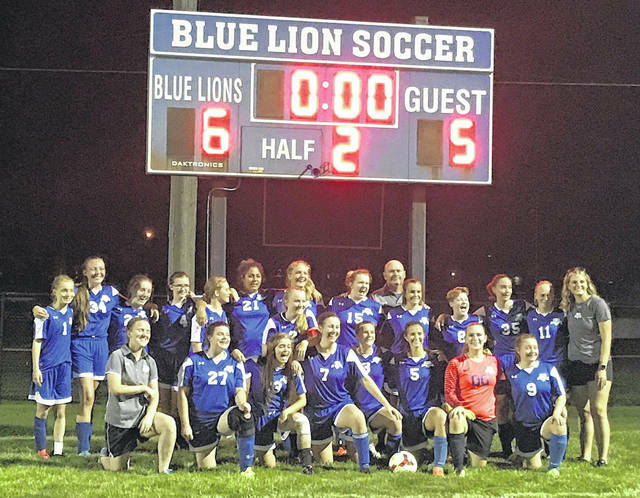 It’s been a tough go for the Washington Lady Blue Lion soccer team up to this point in the season. Actually, for the past couple of seasons. 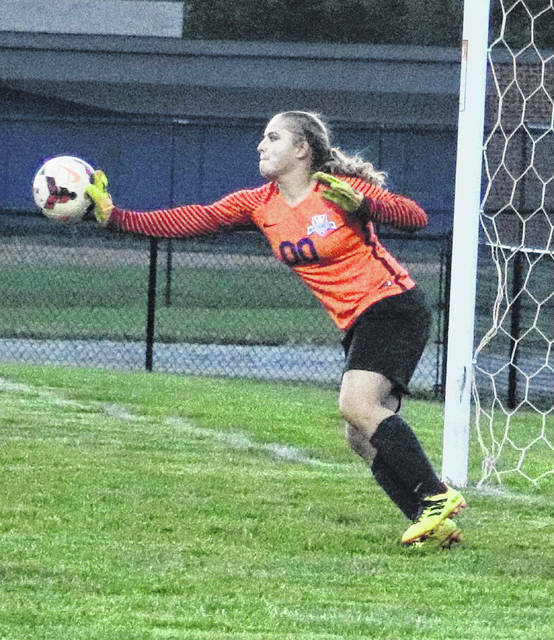 After several disappointing shut out losses to start the 2018 campaign, the Lady Lions finally broke through with three goals in a match against Southeastern on Sept. 6. Thursday night, the Lady Lions were able to notch their first win of the season, 6-5 over the visiting Lady Tigers of McClain High School. “McClain was very physical and did not give up,” Washington head coach Chris Chambers said. “I challenged our defense at halftime to not let a repeat of the Southeastern game happen. “Our defense was able to hold strong and even though we only scored once in the second half, we were able to put in some offensive runs that ran the clock and gave our defense some breaks,” Chambers said. “That was our savior tonight — long, fast breakaways. “Kassidy (Hines) and Chloe (Lovett) were able to get hat-tricks (three goals each) and Arianna (Heath), Hannah (Patterson) and Mackenzie (Shaffer) got some great looks on breakaways,” Chambers said. “That was a game changer for us. “I am so happy for our returners to finally get the monkey off of their back,” Chambers said. “September 15 would have been three years since their last win. The seniors were freshmen! Washington will host Miami Trace Tuesday at 6:45 p.m. The Lady Panthers defeated Jackson Thursday, 3-0. Look for a report on that match in Saturday’s Record-Herald. —Sports Editor Chris Hoppes contributed to this report.